It depends where you look. These days, terrorism seems not just more lethal and more common, but more widespread. The death toll in recent weeks speaks for itself: 22 people dead in Bangladesh, 49 gone in the United States, 44 gone in Turkey, 292 gone in Iraq, then another 37, another 12, yet another 12. And by one oft-cited measure—the Institute for Economics and Peace’s Global Terrorism Index—that’s true. As a rough representation of the global threat of terrorism nearly 15 years after the 9/11 attacks—nearly 15 years after George W. Bush declared that his “war on terror” would “not end until every terrorist group of global reach has been found, stopped, and defeated”—the findings are extremely disheartening. War, they suggest, has only brought more terror. In 2015, terrorist attacks occurred in almost 100 countries—up from 59 in 2013—according to the University of Maryland’s Global Terrorism Database, which the Institute for Economics and Peace relies on for its analysis. ISIS, for its part, appears increasingly to be training its sights on overseas targets as it loses territory in Iraq and Syria. Fear has spread as well. In June, the Pew Research Center reported that ISIS was viewed as the top threat in eight of 10 European countries that it surveyed, edging out other dangers like climate change and global economic instability. Around the same time, CNN polling revealed that Americans were more likely to expect terrorist attacks in the United States in the near future than at any point since March 2003, shortly after the U.S. went to war in Iraq. But why is that? Why, 15 years after Bush vowed to defeat terrorism, does it seem like the world is awash in it? According to Daniel Byman, a terrorism expert at Georgetown University, one of the key explanations boils down to two words: civil war. Byman argues that the severity of the terrorist threat depends on where you look. It’s worth noting that the graph above has its flaws. Collecting data on terrorist attacks is difficult and subjective. (How, to begin with, do you define “terrorism”?) The chart is from the most recent Global Terrorism Index, which does not include statistics from 2015 and 2016. More recent data indicates that the total number of deaths from terrorist attacks actually decreased slightly between 2014 and 2015, with fewer fatalities in Iraq, Pakistan, and Nigeria. Nevertheless, terrorism is in fact “significantly worse in the Middle East” than it was several years ago, before the rise of ISIS, Byman told me. “Europe has a serious problem, though it’s had serious problems in the past” with terrorist attacks in Madrid and London, for example. “And the United States has a problem, but in context with past terrorist attempts”—excluding 9/11, which “was off the charts”—“this is in line with that. … The attacks that have happened [have been carried out by] lone wolves who are dangerous. But that’s actually less dangerous than trained infiltrators like we saw [during the 2015 attacks] in Paris.” Between 2000 and 2014, less than 3 percent of deaths from terrorism occurred in Western countries, according to the Institute for Economics and Peace. Donald Trump asks why they hate us—why jihadists have it out for Americans. 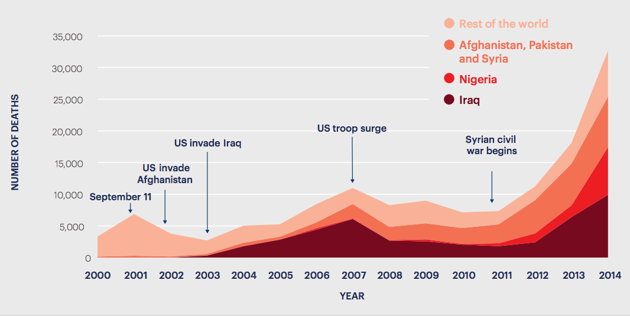 But the data shows that terrorism today is not about us, at least not primarily. Though they may profess hatred of Westerners, terrorists are largely tormenting conflict zones like Iraq, Afghanistan, and Syria. Civil wars like the ones in these countries are particularly potent breeding grounds for terrorist groups, Byman has argued—and this is one reason terrorism has gotten so bad in the greater Middle East. Civil wars increase both grievances and capability, Byman said. They produce vicious cycles of grievances—“you could be displaced from your home, your brother could be shot.” And they produce capability by gutting government authority. If 40 people tried to overthrow the U.S. government, he said, they might kill some people, but they’d also be arrested. But if the U.S. government isn’t functioning because the country’s gripped by civil war, those same 40 people can overtake a town and swell their ranks. “Wars in general create opportunities for groups, and at the same time create grievances that groups feed on,” Byman noted. Which is why one of the signature features of the “war on terror”—the invasion of Iraq—ended up unleashing more terrorism. “When a stable government is destabilized and collapses, that’s very bad from a counterterrorism point of view,” said Byman. This is true with or without massive U.S. involvement, as Syria’s civil war demonstrates. Trump asks why they hate us. But the data shows terrorism is not about us. Not primarily. Still, Byman noted, Americans may perceive terrorism as an acute threat because the 9/11 attacks primed them to view most security issues through the lens of terrorism, whether or not it makes sense to do so. He pointed out that during the Vietnam War, the Viet Cong’s terrorist tactics were generally interpreted as elements of revolutionary or guerrilla warfare, not terrorism. And Europe and the United States experienced far more terrorist attacks in the 1970s and 80s than they do now, though most of these were less deadly than today’s suicide bombings. “Once you discover something that seems new, all of a sudden it’s everywhere,” Byman said. On September 12, 2001, Americans looked at the world anew. The recent car bombing in Baghdad, for example, represented something in between terrorist tactics used in conventional war (ISIS sending suicide bombers to kill enemy forces) and clear-cut terrorism executed outside a war zone (the Paris attacks). The bombing was “clearly directed against civilians, it’s clearly terrorism, but part of the purpose is to advance the Islamic State in a war, to demoralize the Iraqi military and police,” Byman said.